Books For Africa is excited to share the results of our recently completed photo contest! We received fantastic photo submissions from across the African continent; our thanks to our partners for sharing their work with us. 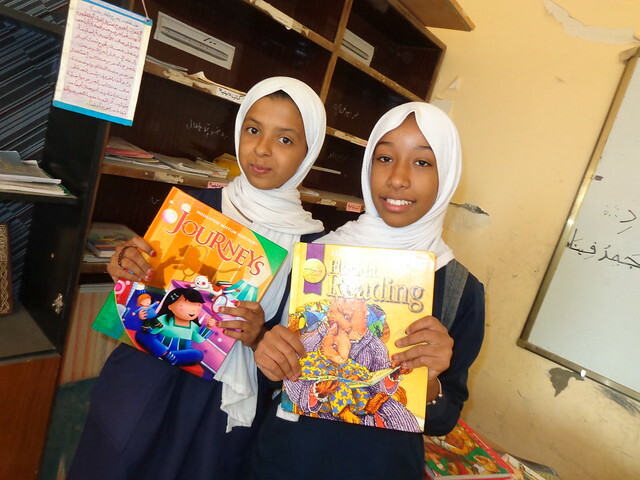 This year's winning photo was submitted by our friends from TESOL International Association in Libya. TESOL received a 40-foot container delivered to Triopli in January 2018, marking Books For Africa’s first ever shipment to Libya! The 22,000 books included in this shipment are currently being used by students, faculty, and community members at over 100 schools of all age levels. Nadia Nuseir, Director of TESOL Tripoli Branch, reports that the books are high quality, relevant to TESOL’s programs, and will help promote literacy and have a positive impact on education. Our thanks to Director Nuseir for sharing this wonderful photo of TESOL students enjoying their new books! In addition to photos, we received stories sharing the excitement of book recipients, and feedback on how the books would impact education and opportunity for the schools and communities where those books are helping to build a culture of literacy. Lawanna Burgess of Perimeter Church shared this photo from Tanzania, reporting that "this is the primary school teachers exploring and discussing all the options around the shipment of books that are now available for teaching in their classrooms...they were ecstatic!" We are proud to be using several of these photos in our upcoming Annual Report, and look forward to holding this fun event again in the future. Books For Africa thanks everyone who participated and shared their experience with us! Make sure to view the full slideshow below or at https://flic.kr/s/aHsmxY4atv.